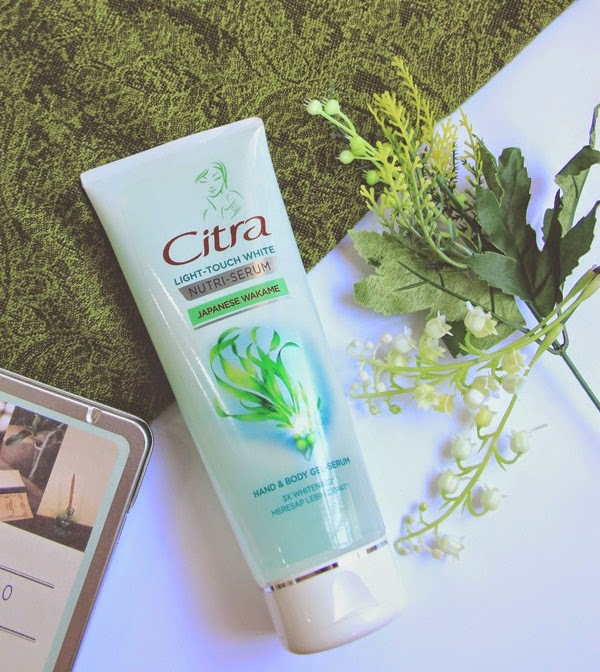 As the owner of dry body skin that absorbs body lotion like a dry sponge absorbing water, I've tried so many body lotion since junior high to find the best (and cheap) ones that can moisturized my skin without making it feeling sticky. I have this strange habit of getting very nervous when I think about something uncomfortable to me. Having sticky hands after puting up lotion is one of them. 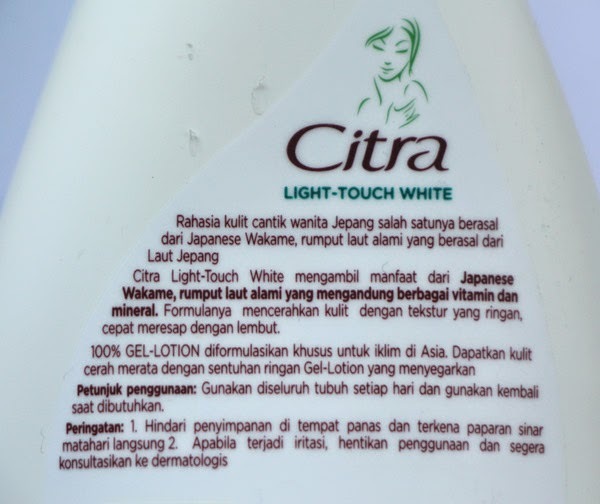 When I heard about this Citra Light-Touch White with Japanese Wakame in a gel form, I was really getting excited to try! 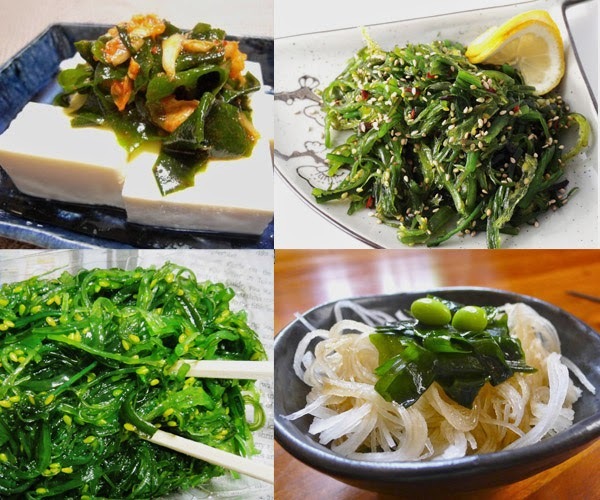 Wakame has been widely consumed not only in Japan but all over the world. It has been served as either garnish, soup broth base, added ingredient or salad for its benefit for our body, including the benefit to help our skin looks younger and smoother. I guess that's why Japanese women are all having great skin and look so young. The best skin in my opinion from all over the world. Japanese is really serious about taking care of their skin. You can see it from their diet and all the nicest A-grade food they have there, no wonder they have the most old people in a country, a lot more than the productives generation! And they all live pretty happy and healthy! Maybe I should just go to Japan and live there. Being an old amah-amah wearing a black and purple kimono, snacking on rice crackers & oranges while sitting under my cozy kotatsu. So anyway, Japanese Wakame contains a lot of good thing for us to consumed everyday if not better. 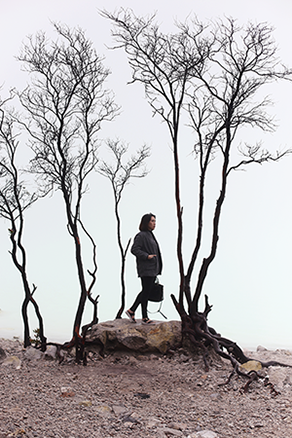 The main function here today is that wakame can help to maintain skin's elasticity so it prevent a faster skin aging and keeping it young longer. 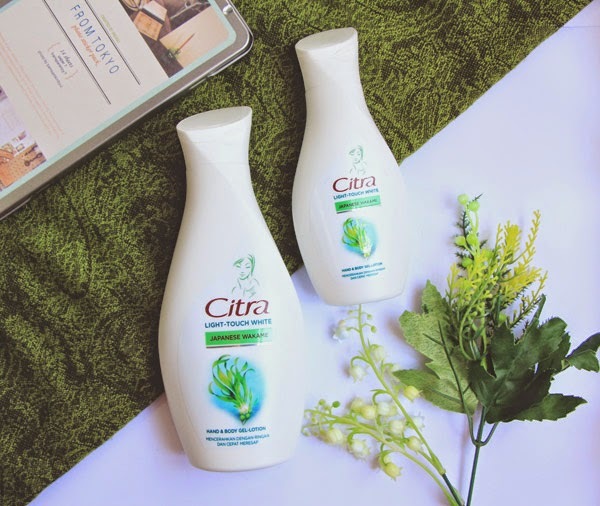 Let's start with the Citra Light Touch White Japanese Wakame Nutri Serum. Body serum has been a trend lately and many brands are making their own to follow the on going trend. I actually don't know exactly how this body serum works. Either to use alone or before the lotion, there's no specific way to use this written anywhere. I like to use it alone cause I think this serum thing is just a marketing gimmick but I like the way they packaged in a tube form which making it easier to dispense the product and to have it used until the last drop, so I got that going for me which is nice! 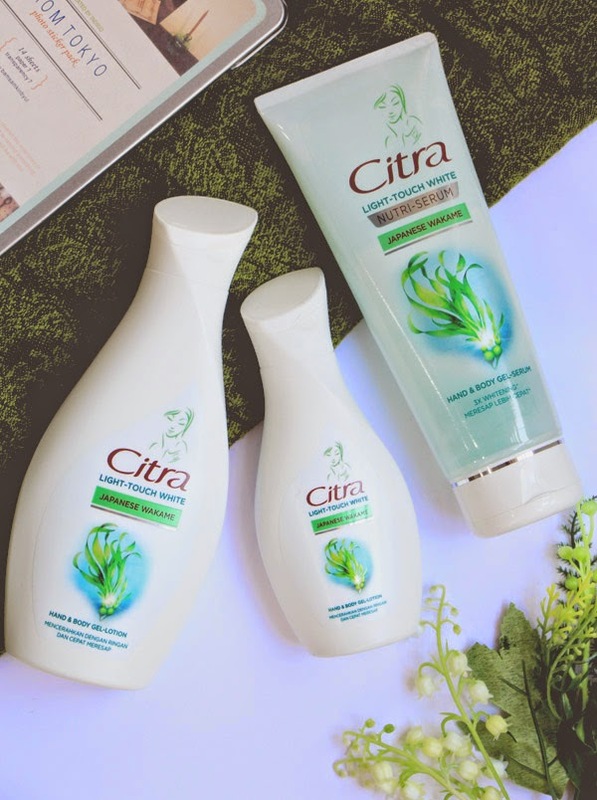 They claimed to have 3x whitening effect compared to their own Citra Pearly White Lotion, very easy to absorbs with the light texture gel lotion, and nourished skin until the epidermal layer. 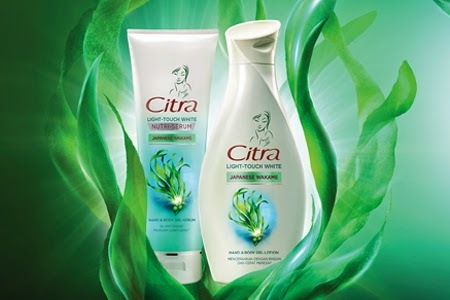 Along with the serum, they also have the Citra Light Touch White Japanese Wakame Gel-Lotion. The only difference I see is they don't put any whitening claim here. On your left is the lotion and on your right is the serum. I don't see much different between the two. But one thing I love for sure from this product is the texture! 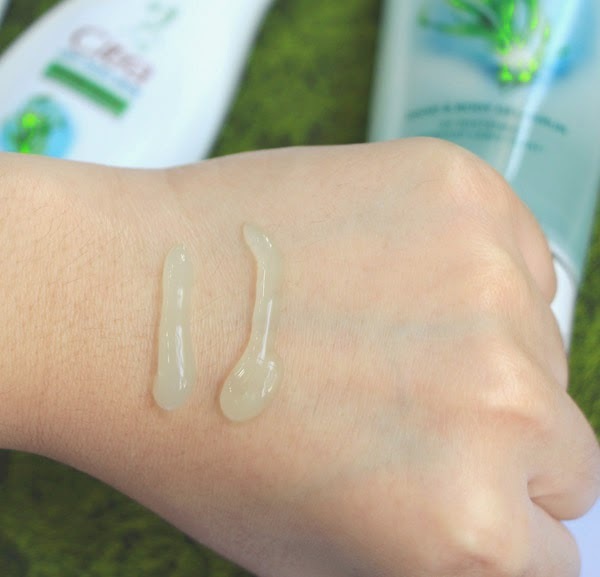 At first I thought maybe it's just the same thing like gel face moisturizer but it is not! It feels so light, airy and cooling when applied! Such wow, much amazing. *insert doge meme here*. 1. ) It reminds me of wearing hand sanitizer but this one absorbs a tiny bit longer than that. This only makes me think I just got my hand been purified eventhough I know it is not. 2. ) I can't feel any greasyness! On my fudging sweaty palms! And there's definitely some cooling effect that makes me feel so refreshed. Never in my life I have encountered any hand cream that gives me such a nice absorbing feeling with no stickyness whatsoever! I even take the small bottle to put in my office to work as a hand cream. cause it is that good! And it smells so fresh and light. A very nice scent for an after bath indulgence. It gives a very nice clean feeling for me. In fact, they have the best kind of scent I personally like, it they make a body spray out of this I'll definitely buy them! After I spread and it absorbs. Would you look at that difference! I didn't notice how much this thing works so great on the whitening claim they have! When I compare my skin with my bare eyes I don't see much difference but when I took this picture I'm like blown away on how it instantly gives me ^ THAT ^! And what I like about this instant whitening effect is, it looks reaaaallyy natural! It's not one of those cream that makes you look pale white like a ghost, instead it gives such a bright & healthy looking skin. 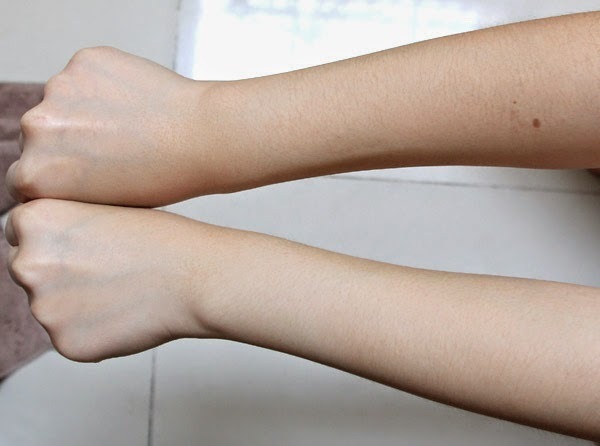 I use both serum and lotion in this picture, but eventhough the lotion doesn't have any whitening claim, it does the same thing for a quick instant whitening effect. Now a great aspect can sometimes leads to a down fall to another part. Since the texture are so light and they absorbs just like water, I don't feel this serum and moisturizer are as moisturizing as I would like a lotion to be. It manage to keep my skin from getting dry but doesn't give me more to make it plumpy. 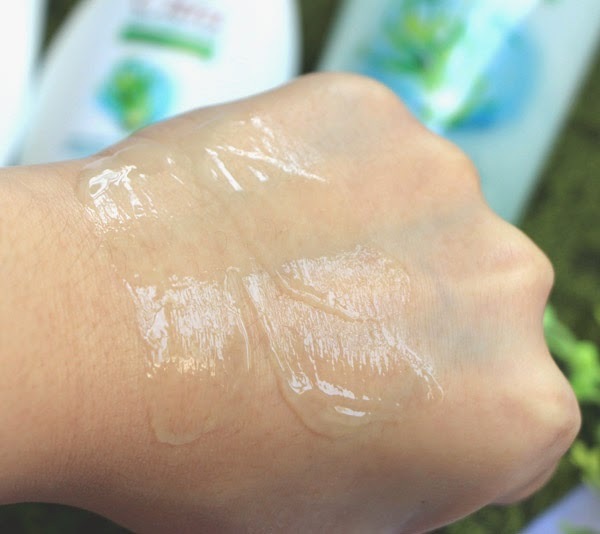 I like to wear it for day time since it helps me to look even fairer and it doesn't leave any sticky feeling and perfect for either hot or humid days we've got here. For night time use, I prefer having body butter or a heavier lotion to moisturize my skin. But then again, I rarely take a bath on my night time. So who am I kidding exactly. But like for an after shave (look at them hairy legs), after scrubs or any other special treatment I'm giving my self this is not a part of it. Since I think both product are the same thing, I prefer to have the serum only because I hate the bottle. In pictures it looks okay but in real life it's such a turn off for me. But the tube for the serum is very nice and fancy looking! It's a half see through tube with calming soft green as the main color. 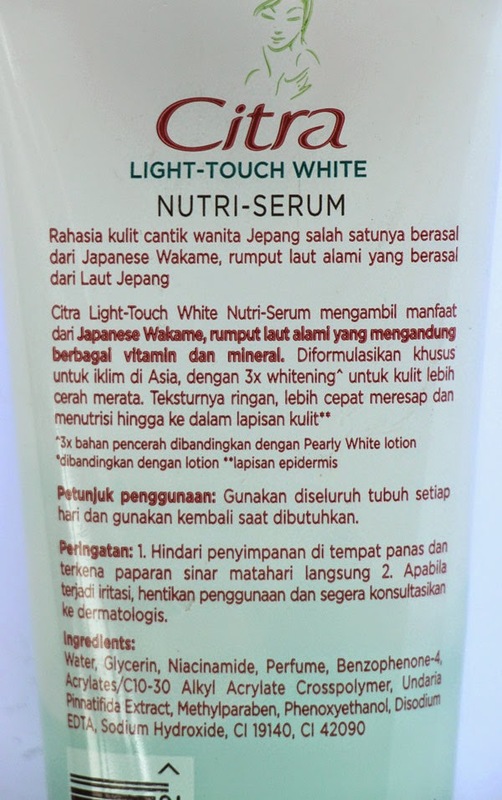 And the word, "Nutri-Serum" sounds very convincing eventhough I know it gives the same effect as the lotion! Yes I'm that shallow as a packaging hoarder. 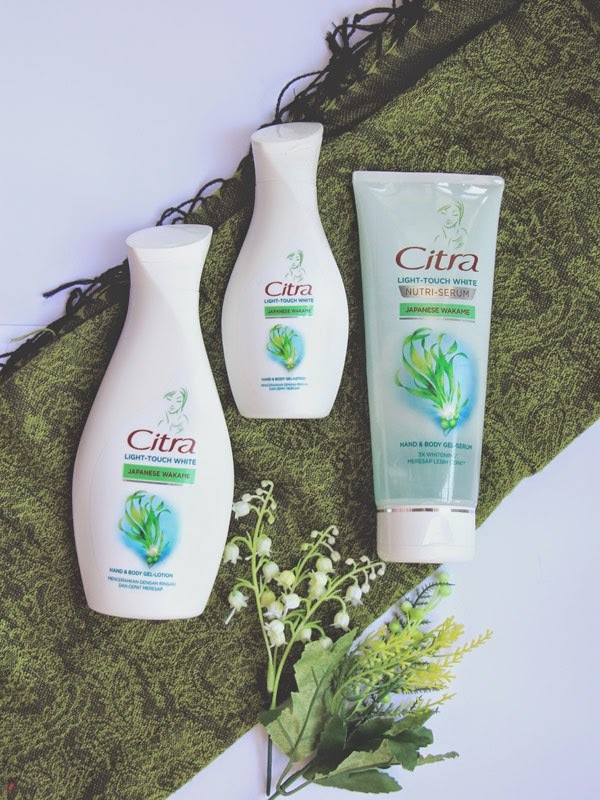 If I'm not mistaken, the lotion is priced around IDR 10.000 (240 ml) and the serum for around IDR 20.000. (180 ml). You can get it like almost anywhere from minimarket, drugstore, supermarket until hypermarket. did you use the body lotion or the serum first?